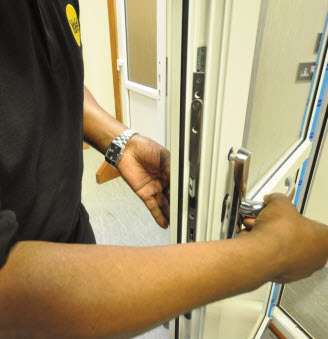 Multipoint locks are fitted to 80% of all new external residential doors and many older multipoint locks are reaching the end of their lifecycle. Over the coming months and years, growing numbers of multipoint locks are expected to fail, presenting a significant opportunity for replacement sales. 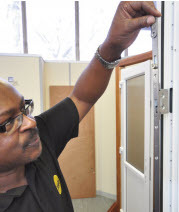 Yale Doormaster range provides a genuine ‘one visit, one repair’ solution thanks to its clever design. 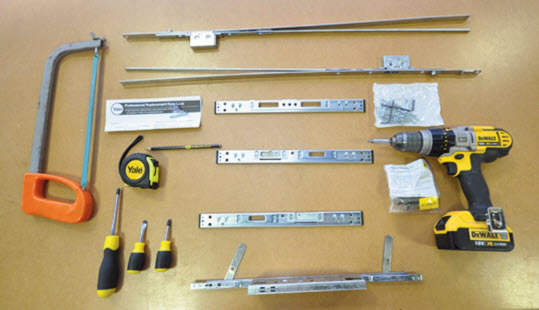 The three models within the range, Universal, Adjustable and Professional, enable installers to replace virtually all PVC-U, composite and timber door multipoint locks with 35mm and 45mm backsets. 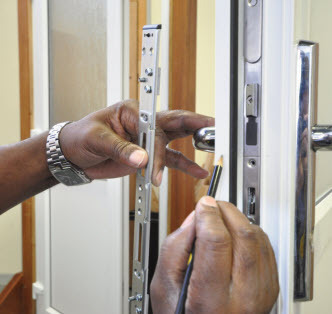 Our illustrations show the Yale Doormaster Professional being installed. Designed with the professional installer in mind, this lock includes flexible ‘crop and mate’ technology, which maximises the scope of installation. For comprehensive installation details please refer to the fitting instructions or visit www.yale.co.uk/doormaster. 1) Identify what tools are required and check that all parts of the Yale Doormaster Professional are present and correct. 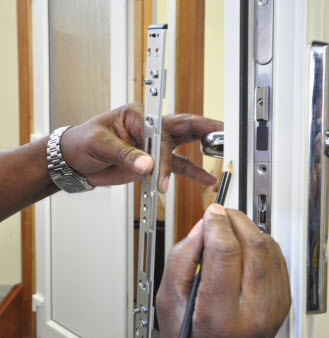 2) Remove all parts of the original lock – handle, cylinder, locking mechanism and keep. 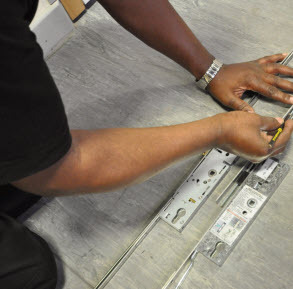 3) Lay the original lock alongside the Doormaster Professional to compare and check suitability. 4) Measure and cut to fit the existing door. The flexible ‘crop and mate’ design enables you to simply cut the lock to length and position gearboxes to match the locks being replaced. 5) When fitting the new lock start by positioning the central gearbox into the centre aperture, then replace the euro cylinder and handles. 6) Mark and fit the center keep of the 3-piece keep and Uni-Packer™ system. For PVCu doors the preassembled patented Uni-Packer allows for fast, easy and reliable installation. 7) Place the top hook gearbox into position in the top aperture, check the top hook operates correctly, then mark and place the top keep into position. 8) Repeat for the bottom hook gearbox unit and bottom keep and set level of compression required. The Yale Doormaster™ Professional is now fitted.